It causes an endothelial dependent relaxation of an in vitro rat aortic ring preparation ( Kang1995gpg ). It regulates scopolamine disturbed learning in rats ( Yamaguchi1996egi ). Re and Rg1 strongly suppress the production of TNF-α and NO microglia-activated lipopolysaccharides ( Wu2007deg ). According to Zhang2006gif , Re in vitro improved the motility of normal human sperm as well as sperm with reduced motility, probably by activation of undetermined endogenous NO synthase. According to Zhang2007grp , Re in vitro facilitated the capability of human sperm by activating an undetermined endogenous NO synthase. 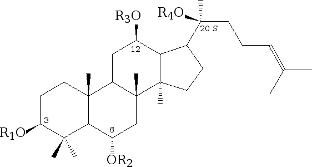 Protects myocardial cells against oxidative damage ( Xie2006aeg ). At a concentration of about 100 μM, it significantly increased the proliferation of T H (CD4 +) and B lymphocyte-stimulated mitogens but restricted the proliferation of IL-2 stimulated T C (CD8 +) lymphocytes with an IC50 of 57.5 μM ( Cho2002gfp ). Most of all panaxosides improved immune cell regeneration, and had a high ability to protect against radiation apoptosis ( Lee2006ivr ). It acts on the androgen receptor, estrogen receptor α and progesterone receptor, and activates myocardium eNOS ( Furukawa2006grm ) after a non-genetic pathway. His cardiovascular effects are devoted to Peng2012grp , which also shows its positive effect on angiogenesis.